PIS promised to rebuild the welfare system, starting with every family unit with two or more children receiving 500 PLN (c. 150 USD) per child each month. 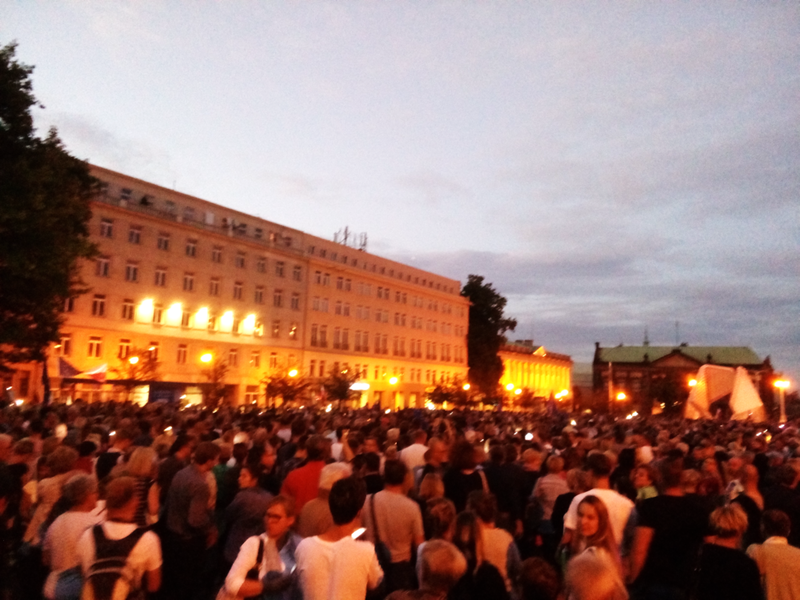 Later it became clear that the population had been lured by the PIS into putting a rubber stamp on their Machiavellian plan to “make Poland authoritarian again.” Today, almost three years into their rule, it is obvious that the checks and balances created after 1989 to support the renewed Polish democracy became the main target of this party. It started with taking over the public media and firing outspoken journalists who did not stand on the conservative side of the political spectrum. The ‘reforms’ - or rather, destruction - continued through violating and harassing members of civil society (taking control over redistribution of the EU funding for NGOs, seizing the computers of women rights activists, smear campaigns in public media); reshaping the cultural landscape (unfortunately, many cultural institutions in Poland relied on the mercy of the state and its donations, and once the political prism at the top changed, progressive artists became the target of the government); and dismantling the Constitutional Tribunal. The most recent and aggressive step - and a clear violation of the Constitution - took the form of demolishing the Supreme Court by trying to remove immediately from office the President of the Polish Supreme Court, Prof. Małgorzata Gersdorf, whose constitutional term ends in 2020. Piece by piece, puzzle by puzzle, Polish democracy has started to resemble a caricature of a democratic system. All of that is happening with very few people protesting. The Homo sovieticus mentality was not easily defeated during the 30 years of neoliberal free-market reforms; instead, through consumerism, it morphed into a new Homo passivisticus – ‘as long as I can have a full trolley in the supermarket, eliminating freedom of speech and tearing apart the rule of law do not bother me’. This gloomy attitude is unfortunately not unique to Polish society; rather, it resembles the old human nature that seeks panem et circenses. A morbid etching by Francisco Goya says: “The Sleep of Reason Produces Monsters” – and this is what has already happened in Poland. But what to do to awaken Reason, especially when a bundle of activists tries to convince people about ideas, not loaves of bread? History teaches that political reason gets awakened through empty stomachs. Is hoping for a new economic crisis then our last resort here in Poland, and perhaps also in the US? Yet, if such a crisis comes to a country with degraded rule of law and legal custom, is not that the clearest path to even stronger populism and ultimately totalitarian rule? Is the reason for such a status quo because we failed as educators…? Amidst teaching students how to mark A, B, C, or D, we have not taught enough love for human rights and for freedom, and now we see that 500 PLN became the price tag to compromise them. Łukasz W. Niparko LL.M. is a human rights advocate. Łukasz holds a degree in international human rights and humanitarian law from the European University Viadrina and in Global Studies from St. Lawrence University. He has served with various NGOs such as The American Civil Liberties Union (ACLU), Humanity In Action (HIA), and Polish Humanitarian Action (PAH) as well as with the public sector as the Pat Cox Fellow in the European Parliament.